Karlsson previously won the Norris in 2012 and again last season, when he had 66 points and a plus-7 rating in 82 games. 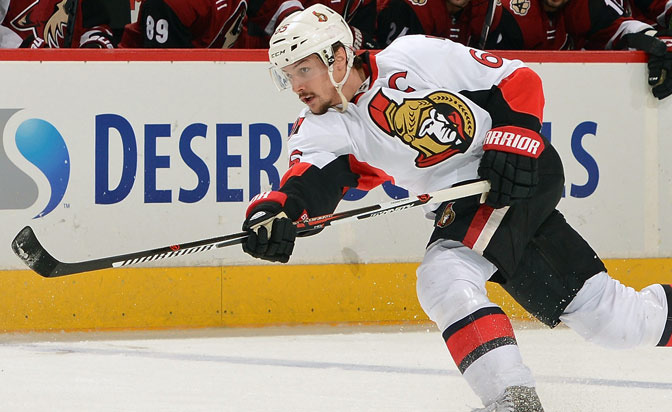 "[Karlsson's] like all elite players," Senators coach Dave Cameron said. "Sometimes their biggest strength becomes their biggest weakness. What I mean by that is they are able to take the puck at different times and just go and dominate. Sometimes when the game tightens up or the team is struggling, they grab that puck and actually try to do too much. That's a maturity. Every elite player has done that. They will do it. That's what makes them elite. They want to be the dominant force at that time. "As they mature, they start to read the play a little bit, tend to 'less is more,' but still at the time when the game is on the line, they don't want to come off the ice. They want the puck, they want to make the difference. Certainly, [Karlsson] has grown over the years and he's getting better at it. As much as he's talented, his biggest strengths are his competitiveness and how smart he is. He gets it." Drew Doughty, Los Angeles Kings: Doughty has played a huge role in the Kings' resurgence. He has seven goals in 41 games, but he has a plus-16 rating and is consistently going up against the opposition's top forwards. Doughty ranks third in the NHL with an average of 27:59 of ice time. "I know I'm a completely different kind of defenseman than Erik Karlsson is and (Montreal Canadiens defenseman) P.K. Subban is too," Doughty said. "They play completely different from me, so I really don't even see how I'm comparable to them with the two styles of play. I'm sure those comparisons are going to be made. I just want to show everyone I can play good hockey both ways and that I do deserve to be in those [Norris] talks. "I would love to win [the Norris] one day. It's not all I think about, that's for sure. It's always in the back of my mind. All I really care about is contributing to this L.A. Kings team and hopefully winning some more championships. If we have a good team and I'm playing well then hopefully I get recognized that way. The Norris is an individual trophy and I'm all about team trophies. That's all that matters to me." John Klingberg, Dallas Stars: Forwards Jamie Benn and Tyler Seguin continue to receive the bulk of the credit for the Stars' fantastic start, but Klingberg, 23, is emerging as a world-class defenseman. A fifth-round pick (No. 131) at the 2010 NHL Draft, Klingberg ranks second behind Karlsson with 38 points (six goals, 32 assists) in 44 games. He has a plus-10 rating and is averaging 23:24 of ice time. "Well, it's nice," Klingberg said of getting some recognition. "It's nothing I think about at all. Obviously, with this team we score a lot of goals and the points are going to be there sometimes too. That's something I'll let you guys (the media) talk about." ALSO IN THE MIX: Duncan Keith, Chicago Blackhawks; Oliver Ekman-Larsson, Arizona Coyotes; Ryan Suter, Minnesota Wild.